(JUNE 13, 2018 – LONDON) - The International Youth Federation (IYF) President Krystel SANEH has announced the appointment of Julia Blocher of the United States of America as Vice President. 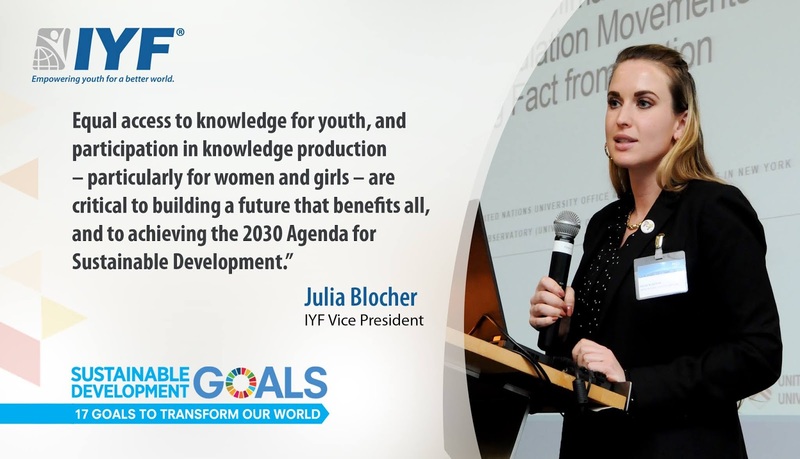 “We are delighted to welcome Julia to the IYF. Her values, academic and international expertise are in line with our strategic objectives and we have no doubt she will make great contributions to our efforts to empower youth worldwide,” said His Excellency Ambassador Saeed ZAKI, IYF Secretary-General. Ms. Blocher brings to this position a wide range of experience in think tanks, academia, and evidence-based policymaking. In her impressive career, she has served as a Project Manager at the United Nations University (UNU), Project Assistant for the ‘Politiques de la terre’ (Politics of the Earth) project at Sciences Po Paris, Communications Officer at the Internal Displacement Monitoring Centre (IDMC) of the Norwegian Refugee Council, and as a Special Projects Consultant for the United Nations Refugee Agency (UNHCR). Ms. Blocher holds a Master’s degree in International Affairs from Institut d’Études Politiques de Paris (Sciences Po Paris) and is currently completing a Doctorate in political science at the University of Liège (Belgium). The International Youth Federation is an international non-profit youth organizations network governed by its statues and the Swiss Civil Code. It is politically neutral and non-denominational, aimed at empowering youth worldwide through improving the status of youth and promoting cooperation between youth organizations in different countries.